Design-it-yourself or hire a pro? Either way, you want to weigh your options carefully. For self-published authors visibility is key. Generating visibility takes time and persistence and includes everything from a Twitter feed to commissioned book reviews. But a great book cover can generate more buzz and visibility than most social marketing plans and pay-to-play endorsements. And in today’s online world, a book’s packaging -– binding, paper stock, etc. –- is thrown out the window. Online, the only distinguishing feature is the cover. With online book sales growing, and e-books taking off, cover design has become more important. Without the budget or marketing team of a big publishing house, self-pub authors have to weigh their design options carefully. Options vary depending on the author’s skill set, time frame and resources. A convenient option is to work with outfits like The E-book Editor that include a cover design as an add-on to their editing and digital conversion services. The E-book Editor charges $99 for e-book covers and $199 for print book covers. But only about 50% of the authors O’Byrne works with request a cover design. What are the other authors choosing to do? The most affordable and in some cases cost-free option is to do it yourself. Self-published author Keith Robinson self-designed the covers of his Island of Fog fantasy series. Using images from stock photo websites, Robinson manipulated pictures to recreate scenes from his books. 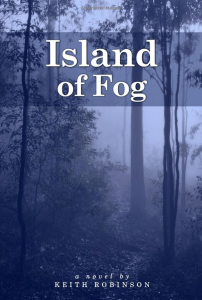 In his first book Island of Fog, Robinson went with “simple but effective.” He found an image of foggy woods, tinted it blue, and added the title and author credit. However, Robinson admits that there has been a learning curve. In his subsequent books, Robinson seized the attention of his YA audience with flame-breathing dragons. 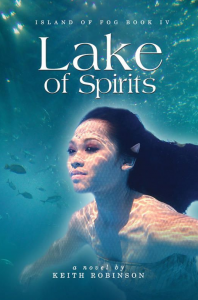 For the cover of his latest book, Lake of Spirits, Robinson transformed a woman into a jengu, a water spirit with pointy ears like an elf, using graphic design tools. But some authors see the need to invest in winning cover art from the beginning. White, who works as a tagline writer for Universal Pictures, believes book covers are analogous to movie posters. “A movie poster can often determine whether a film gets buzz, or fizzles at the box office. Likewise, a well-conceived, well-executed book jacket design translates into a book cover that motivates readers to crack the cover or download the e-book,” said White. Unlike fantasy author Robinson, White does not self-design her books. Her friends and colleagues at Universal and photographers at the car auctioneer Gooding and Company are helping to create her book covers. Authors without pre-established relationships with designers, or graphic design skills, are left to other devices. Often the first stop in finding help is online directories, forums or message boards. But this time-consuming option yields few results. “Sites like Elance and Craigslist can help you with your hires, but it’s really hard to find folks specialized in the e-book space,” said Miral Sattar, founder of Bibliocrunch, a self-pub platform which facilitates relationships between book professionals. On BiblioCrunch, professionals can sign up as an author, designer, editor, copy editor, publisher or reader. Authors can convert their books for digital distribution while searching the site for a cover designer. One key feature of Bibliocrunch is the rating and review system where designers, and other professionals, are given testimonials on their work. “Most authors like to work with someone whose work has already been vetted or vouched for,” said Sattar. While specialized online communities cut down on the riff-raff, developing professional relationships online is difficult and takes patience. For authors who are eager to enter the market quickly the answer may be crowdsourcing. On 99Designs, authors can commission book cover designs. The first step is drafting a design brief which provides the crowd of designers with a better understanding of the project. This includes a description of the author, the book, and specific technical guidelines like file type, document size and resolution. After setting a price, which can range from $195 to the project’s budget limit, authors can kick back as dozens of designs are submitted from around the world. 99designs already has over 100,000 registered members. 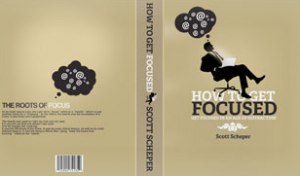 In 2009, author Tim Ferriss ran a design project through 99designs to generate ideas for The 4-Hour Body. In 7 days more than 450 designs came in. Ferriss awarded 4 finalists $250 each. With varying price points and a multitude of resources online, self-pub authors have more options every day. Whether they opt to crowdsource, outsource, collaborate with friends, work with new online contacts, or go it alone, the goal is clear -– maintain the same level of quality consumers have come to expect from the industry giants. This begins with the cover and ends with the story. Andrew Pantoja is Associate Publisher at Practising Law Institute (PLI) in New York City. PLI is a non-profit organization that publishes books and produces seminars for lawyers and business professionals. Andrew oversees the day-to-day operations of the publishing division, plans and coordinates book acquisitions, book marketing and financial planning, and assists in the production and design of PLI’s books. He is on Twitter @andrewpantoja. DISCUSS: Who Are the Best Service Providers for Self-Publishers?